Author of 'Little, Big' and other award-winning novels gives talk on transformative historical fiction. John Crowley received the Award in Literature from the American Academy of Arts and Letters in 1992, and has taught for many years in the English Department at Yale. His first published novels, "The Deep" (1975) and "Beasts" (1976), were science fiction that transcended the genre, receiving praise from poets like James Merrill and John Hollander. "Engine Summer" (1979) was a finalist for the National Book Award. In 1981 his novel "Little, Big" won the World Fantasy Award for Best Novel and was called a “masterpiece” by the critic Harold Bloom. In 1987, Crowley embarked on an ambitious four-volume novel, "Aegypt"(The Solitudes; Love & Sleep; Daemonomania; Endless Things). His recent works include "The Translator" (2002), recipient of the Italian Premio Flaiano prize; "Lord Byron’s Novel" (2005); "Four Freedoms" (2008) and "Ka: Dar Oakley in the Ruin of Ymr" (2017), recipient of the Mythopoeic Award. Crowley has also written award-winning scripts for short films and historical documentaries, including "The World of Tomorrow" (on the 1939 World’s Fair), "No Place to Hide" (on the bomb shelter obsession), "The Hindenburg" (for HBO), and "FIT: Episodes in the History of the Body" (examining American fitness practices and beliefs over the decades). 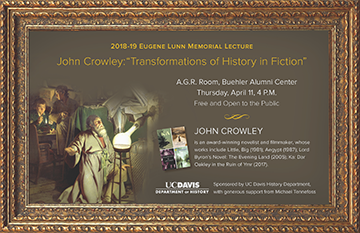 The Lunn Lectureship commemorates Eugene Lunn, who was an esteemed member of the UC Davis Department of History and distinguished himself as a scholar in the field of modern European intellectual history. He was a passionate and productive scholar, but no less an engaged and inspired teacher. In his memory, a fund was created to support an annual lecture series that would honor the profession of history and present to a broad campus audience an exemplary discussion of significant issues in culture and society. The lecture, thanks to the generosity of many people, has become an important yearly event at UC Davis. We particularly want to thank alumnus Michael Tennefoss for his generous donations that have made this series possible. Click on image below for full-size poster.